Refer your designer friends and if any of them join to A' Design Award and Competition by making a paid nomination, you can join for free. Or use this program to halve the cost of joining. This campaign provides you the opportunity to join the A' Design Award & Competition free of charge or earn nomination tickets. 2. Refer A' Design Award and Competition to your friends with your own methods. 3. After your friends nominate his/her designs, let us know by sending us a mail, remember to mention their names. 4. You will receive your free entrance ticket within 2 days after we check your friends nomination. 1. 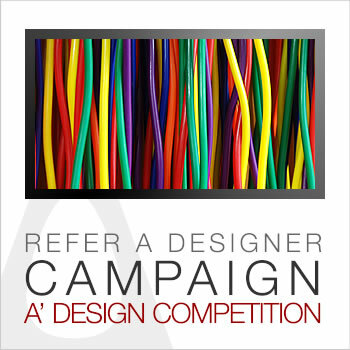 Show your friend whatisadesignaward.com, where A' Design Award and Competition is explained detail. 2. You might also mention that if 2 people join, you will pay only half of the payment (i.e. one of you will get a free nomination). 1. Your designer friend should make a paid submission. 2. You cannot use this program to make a second free submission for yourself. 3. You can use it to make a second free submission to your friend! 4. You will receive a free nomination ticket. You should use this ticket yourself. In exchange for a Nomination Ticket, you might propose to write an Article about A' Design Awards or write an Article about A' Design Award Winners at your association website. In exchange for 1 or more Nomination Tickets (depending on membership number and structure), you might propose to send a communication to all your members regarding A' Design Awards or its winners. Furthermore, we are willing to sponsor associations or large clubs for this type of communication, please contact us for further possibilities.